Six larger diameter balls (20% larger) instead of the seven balls used in most 608 bearings - higher speed, faster acceleration, greater strength and durability. 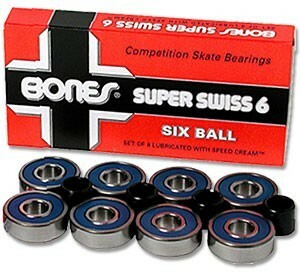 Bones Super Swiss 6 bearings in an 8 pack - Regular 608 bearings. 6 balls are in diameter than the balls used in 7 ball Swiss.